I recently purchased Space Hulk on Steam for Mac and thought I’d write up a personal review from the perspective of someone who likes the board game, and video games. Let’s start with the good stuff: it’s Space Hulk, with current generation rules. 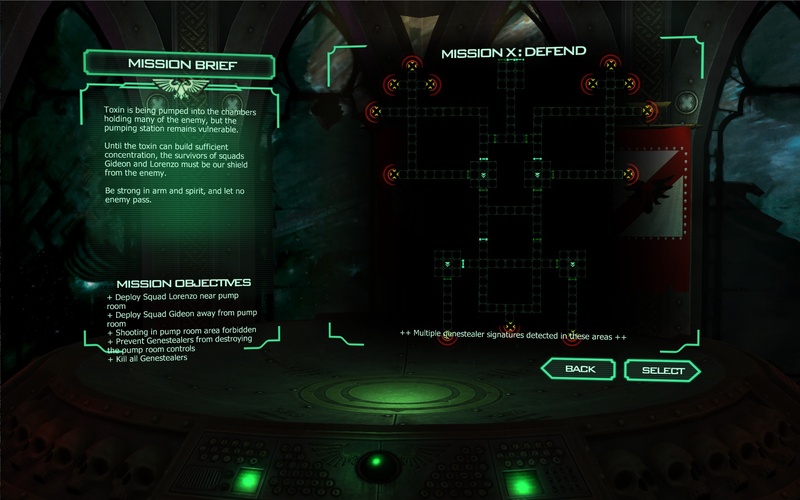 The game contains the 12 missions from the board game plus a short prequel consisting of 3 new missions that serve as a tutorial. The rules are faithfully reproduced with one (major) exception – a model can be activated again and use any of its remaining action points even if a different one has acted since. 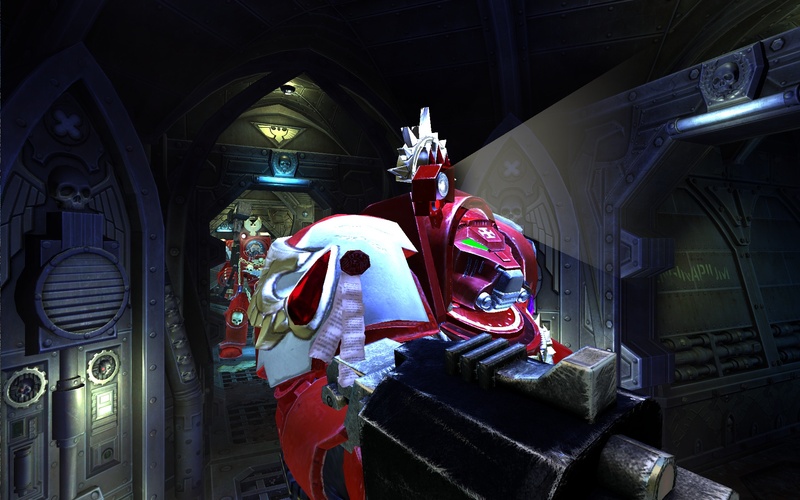 This gives an advantage to the Space Marines who have the edge in this video game version as opposed to the board game. Playing against AI is also easier than playing against an experienced human opponent, which is not to say that the AI is particularly bad. There are three difficulty settings: Easy (no jamming and close combat bonuses for the Terminators, i.e. missing the point of the game entirely), Normal (no timer but otherwise as the board game with the exception noted above) and Hard (2 minute timer for the Space Marines and a maximum of 4 command points, giving the closest overall experience to the tabletop version). 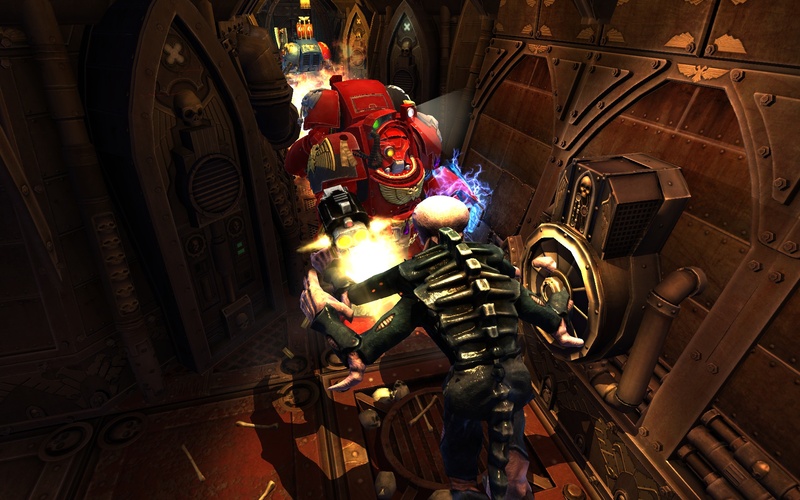 There is also a multiplayer mode, which is the only way of playing as the Genestealers. Next to hotseat play you can play online, though the options are very limited. It is not possible to use the Steam friends list, instead one has to create a separate account or play against random opponents. When creating a game you decide whether to play as Terminators or Genestealers and choose any of the missions. There is no game lobby, you just get to set up a game, and wait. Neither the Space Marine nor Genestealer player gets a time limit, which not only detracts from the tension but also means waiting around for too long most of the time in between turns. There is in-game chat and the two different players I played against so far have been very pleasant. One of my opponents actually pointed a possible exploit for the Genestealers out to me – since models can be re-activated there is nothing to stop a player from moving his Genestealers one step at a time in the line of fire, shortening the distance all models in the line have to take to reach their target with each overwatch shot that doesn’t kill the first. I haven’t tried it out and it sounds tedious and fun-sucking but it could potentially break the multiplayer experience. 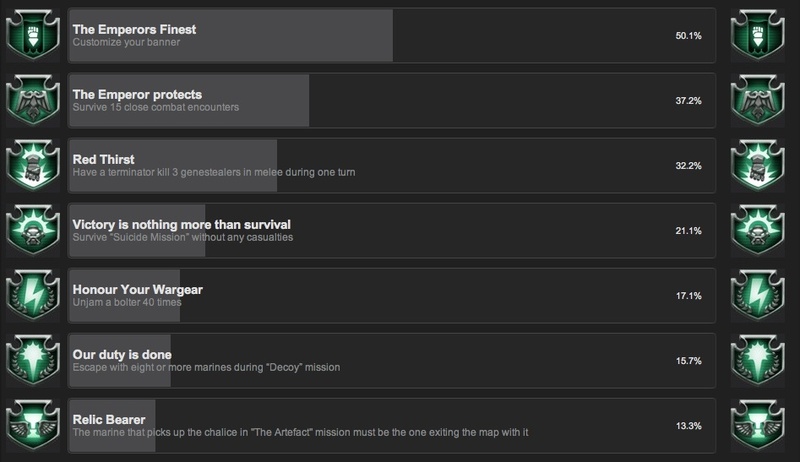 A set of achievements on Steam provide some additional goals, most of which are quite easy to complete. 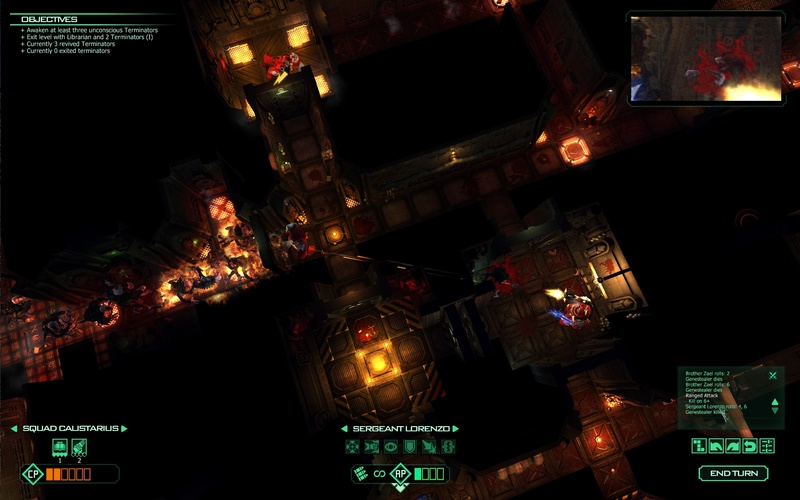 On Normal difficulty, the mission targets are often met on the first playthrough. Moving on to the outright bad. 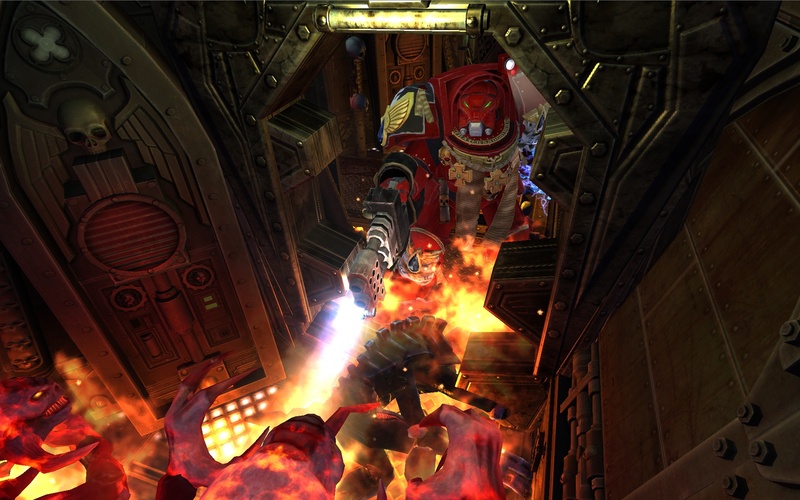 Space Hulk is a smartphone/tablet game that is being sold for Mac/PC at a Mac/PC price of £22.99. It’s a cynical move on the part of developer/publisher Full Control in order to milk game sales at a high price point before releasing the same game on iOS at a much lower price in line with that platform’s pricing structure. Unless there are free mission packs to come for buyers of the Mac/PC version, it’s simply a rip-off. Looking at the only currently available add-on purchase, a new Genestealer skin for £1.59, it looks very unlikely that this is going to change. My advice would be to wait for a Steam Sale or buy a PlayStation and the 1996 version Space Hulk: Vengeance of the Blood Angels which comes with an original full campaign plus 34 individual missions. Despite the brevity of the game there are still plenty of bugs to iron out, so I feel like having paid a premium for the privilege of being a beta tester. Twice did I get stuck on the Defend mission without the possibility of ending my turn. In the first multiplayer session, my opponent had to give up shortly before finishing my squad off due to not being able to deploy any of his blips. During the third (and so far last) multiplayer match my opponent had a connection error and I was left wondering what might be going on before he had the chance to reconnect several minutes later. Hardly worth mentioning in light of those serious problems that the game also crashes on exit all the time. Apple will be getting annoyed by my Problem Reports already I assume. The controls in the game feel sticky, which more than once had me send Terminators off in the wrong direction, ruining my best laid plans. You have to be patient and gingerly with the buttons, which is a particular nuisance under a 2 minute time limit. 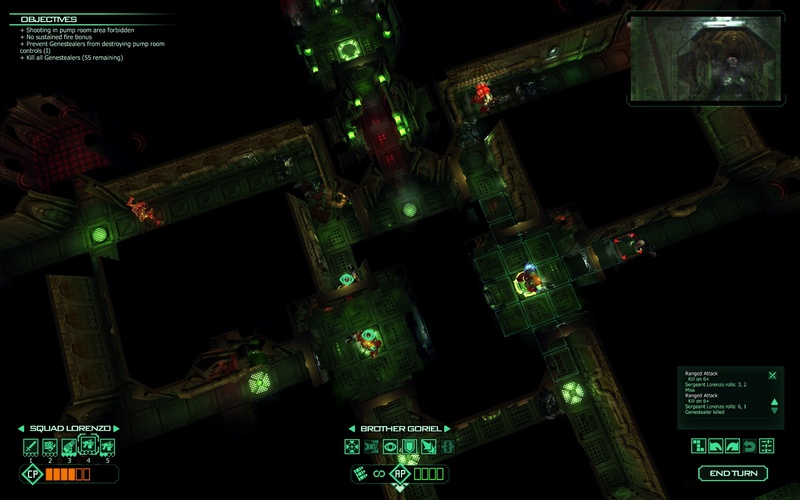 The graphics are at a smartphone level, which is a reflection of how far smartphones have come, but not sufficient for a desktop computer game. It wouldn’t be so bad if the highest quality setting wasn’t called “Fantastic”. Seems like a joke at the buyer’s expense. There is also an abundance of collision detection bugs which spoil the immersion, from model textures that look hacked apart to projectiles passing unhindered through solid surfaces. The sound is a mess, half of the time the weapon noise is missing from the action cut-scenes. The sound effects in general are very basic, low quality and flat, with only short bits of menu music and no atmospheric soundscape in-game. There is nothing in the way of statistics which would be so easy to collate. I’d like to know for example which of my Terminators is the best shot throughout the campaign etc. Even in multiplayer there is no record of matches. Rounding the overall impression off are examples of general sloppiness like text overflow which should not happen in a spacious layout and in the original language the game was designed for. In summary, I enjoy playing the classic that is Space Hulk. I enjoy it because of the core game being a masterpiece in tabletop design. Unfortunately Games Workshop’s choice of developer and publisher for this conversion to video game has let the IP down. This is a story all too often repeated with their licenses. Games Workshop either does not much care about the treatment of their products in the digital space or the people in charge of looking after this side of their business simply lack any clue and can’t properly evaluate potential licensees.